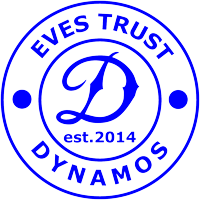 Learn more about the Eve’s Trust Dynamos football team. Eve’s Trust Dynamos is an extension of a legacy Eve Merton & her husband started back in 1972. Eve, her then husband Eddie and Peter Thurlow (another local father) started a junior football club by the name of Cornard Dynamosafter they sons enjoyed a kick about on the local field but had no local team to join. Since 1972 the club has grown from strength to strength and has seen thousands of children & their families become a part of their history, including ex. Arsenal striker Perry Groves. Eve became club secretary to the club and went about a number of fundraising events to help get the club started, sponsored walks, bikes rides and even support from then professional football player Rodney Marsh. Dynamos established themselves into the league initially wearing blue & white and are still a part of the Colchester & District Football League today, now changing their colours to red & black. It is testament to that commitment and dedication to give their local children a friendly safe place to play football and be part of a team that inspired us at the Trust to establish Eve’s Trust Dynamos consisting of both senior and junior teams. We hope our teams can honour the history that has gone before by creating some of our own and continuing their story.